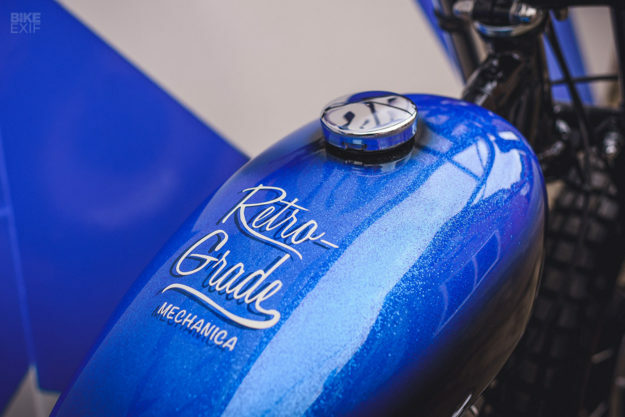 Triumph’s range of modern classics now stands at twelve models strong. That’s good news if you want all the style of Britain’s most prolific marque, without the fuss linked to owning an older machine. 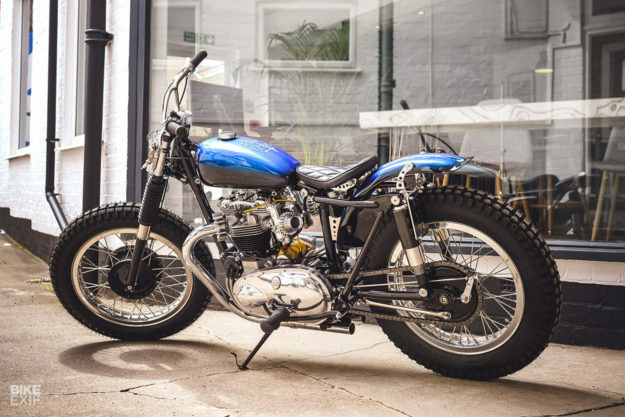 But as much as we’d love a couple of modern Triumphs in the Bike EXIF dream garage, we’d simply have to park a truly vintage one right alongside them. And this delightful 1958 Tiger T110 from Retrograde Mechanica will do just fine. Retrograde is the side hustle of Mark Drury, who is based in Northampton in the English Midlands. He normally works alone, but on this project he teamed up with Nick Dyble Engineering. Which is just as well: since they were dealing with a sixty-year-old donor, they had their work cut out for them. With no client to answer to, Mark had an open brief to work from. Luckily, he had a pretty good idea of what he wanted. 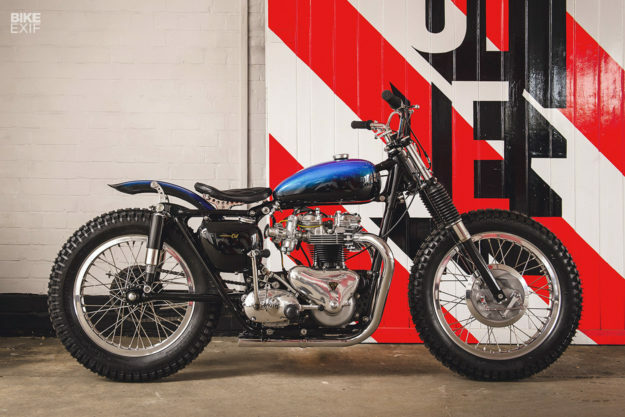 “Being infatuated with desert sleds and dirt trackers, it had to go that route,” he tells us. “It had to be a pre-unit Triumph—I’m a self-confessed Meriden groupie—and it had to have flake. 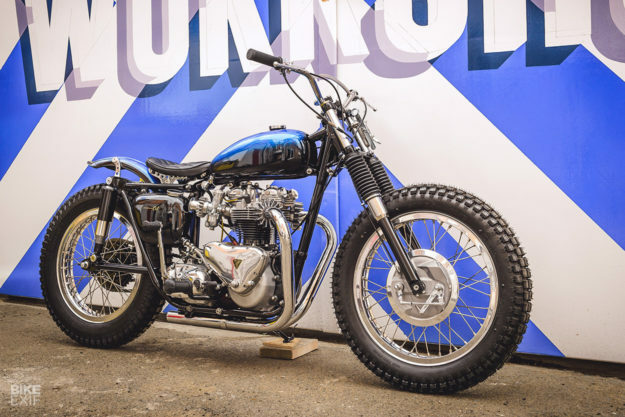 Lots of flake, and lots of polished parts.” Final influences were taken from the ‘Pitty Tink’ Triumph tracker built by Jim Anderson and Arnold Jean in 1957, and the bikes ridden by greats like Skip Van Leeuwen in the mid 1960s. 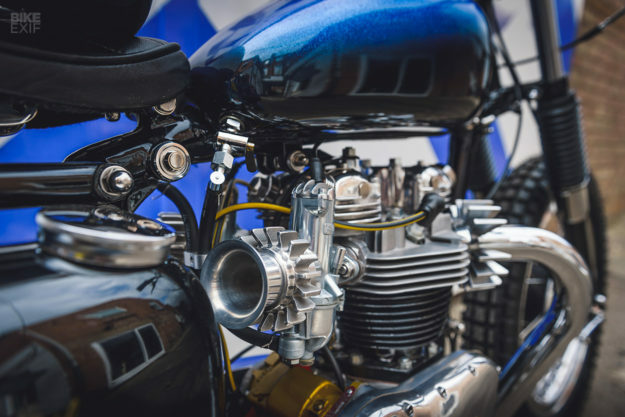 The original crankcases are now playing nice with a Triumph one-piece crank, a four-spring clutch with a SRM pressure plate, and a 1967 NOS Bonneville splayed twin carb head. The power plant also features nine-stud barrels, 3134 cams, a Hayward belt drive, and a NOS primary case. Mark’s kept the standard T110 four-speed transmission, but added a new Lucas K2FC competition magneto. 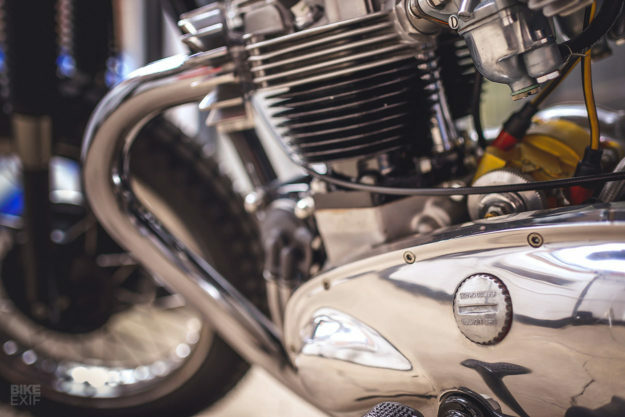 There’s a lot of detail work around the engine—like the fuel line fittings and clamps, braided oil lines, and remote oil filter mounted in the dynamo hole. 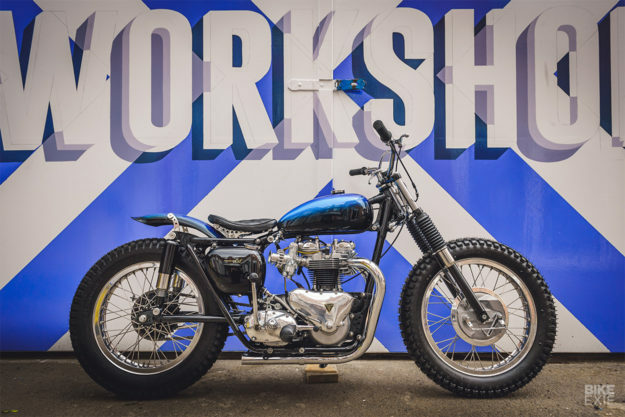 Mark and Nick have gone to town on the T110’s original frame. The geometry’s unchanged, but they’ve de-tabbed, re-brazed and smoothed the whole thing. They’ve also strengthened and braced it, and moved the rear crossmember forward, to make room for the new fender and seat mounts. The front suspension is now a set of post-1967 external spring forks, and there’s a pair of shrouded Hagons holding up the rear. New Akront flanged alloy rims have been laced up with stainless steel spokes—a 19” at the front, and an 18” out back. The front’s hooked up to a NOS Triumph full-width TLS hub, and the back’s mated to a Triumph QD hub, with a one-off stainless steel torque arm. 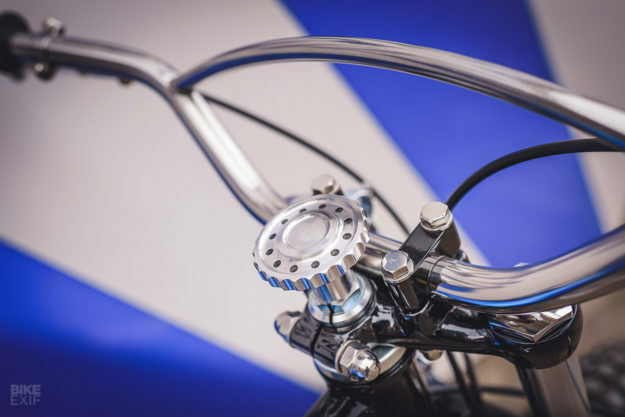 For controls, the guys installed a set of 7/8” bars from Front Street Cycles, along with an Amal throttle, Biltwell Inc. grips, period-correct levers and Venhill cables. The kill-switch sits in a custom-built unit, set inside a sidecar mounting lug below the seat. The build’s capped off with carefully selected, off-the-shelf bodywork. 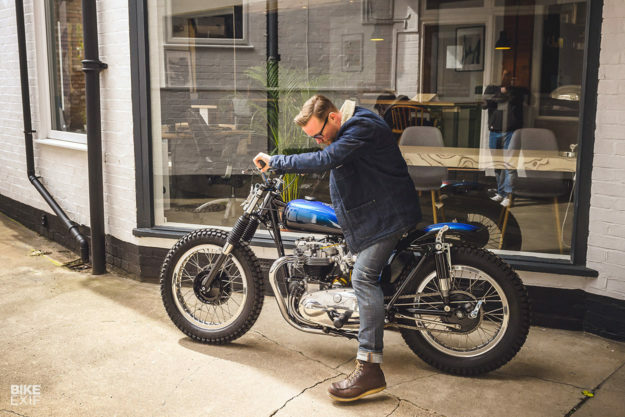 From front to back, we have a NOS Wassell banana tank, an HD Parts pleated seat, and a British-made rear fender of unknown origin. 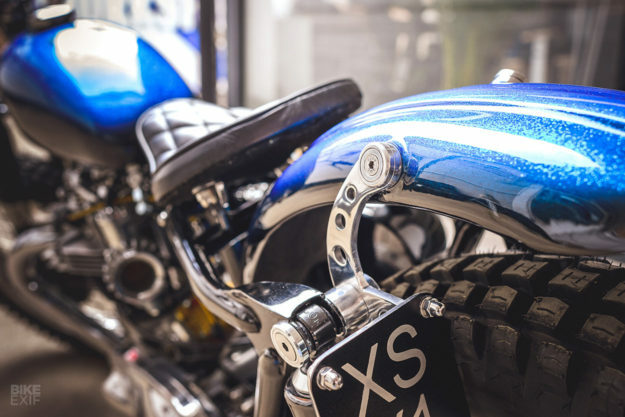 The seat and fender sit on one-off 5mm alloy brackets, attached with hidden fixings. There’s also a license plate bracket integrated into the left one. Tucked under the seat is a modded pre-unit Triumph oil tank. It’s been mounted tight to the frame, and had a new back welded in. The T110’s stock foot controls are still in use, but they’ve been freed of their casting marks. Mark and Nick have sprinkled the build with an inordinate amount of hand-made touches. The fork stops, steering damper and exhaust brackets are all custom, along with a various spindles and spacers. There’s even a little arrangement just the left of where a headlight would normally go, that holds a spanner and a couple of spare spark plugs. Then there’s the sublime metalflake paint. Flakey Dave Addis knocked it right out the park, with a black candy to blue metalflake gradient. The only branding is a little cream sign writing on top of the tank. Props must go to A and C Auto Finishers, who coated the frame, forks and yokes. Unique Powder and Paint redid the barrels in stove enamel, Ash at Motoshine polished everything up, Terry and Protec handled the plating work, and everything looks tickety-boo. 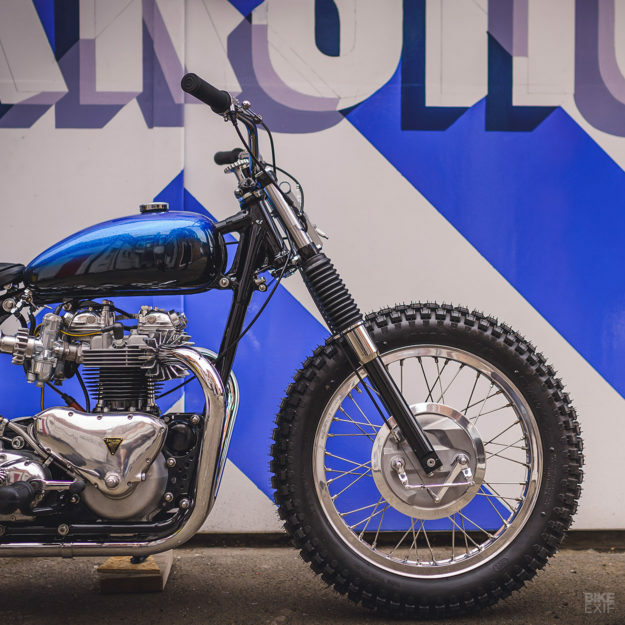 It’s a beguiling mix of polished, plated and painted bits, and a restomod done just right. Even parked next to a modern bike, it’s sure to pull all the stares.